Made with the same skill and materials as the larger axes, the Agelsjon is a compact, portable axe, ideal for short trips, camps and woodworking. The 9 1/2in oal makes it a highly controllable tool, as well as being easy to transport and light in the hand. The 1lb Hand Forged, High Carbon steel head is a great cutter and 58HRC hardness gives excellent edge holding. 1lb Hand forged HC steel head. 2 3/4in cutting face. Hickory handle, with double wedge. 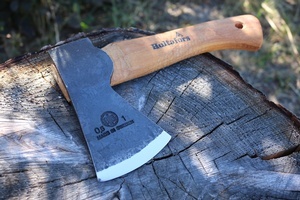 Purchase through PayPal by using the "Add To Cart" button above or use the form below to order the Hultafors Agelsjon Mini hatchet . Feel free to contact us if you have any questions about the Hultafors Agelsjon Mini hatchet .